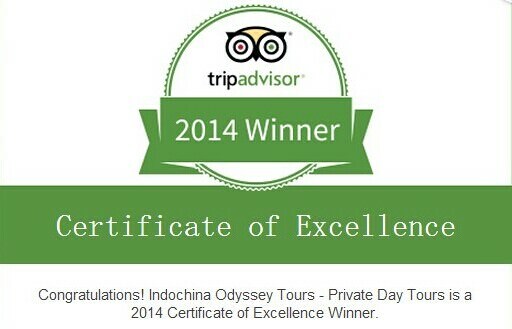 We are very delight to announce that Indochina Odyssey Tours was awarded the Certificate of Excellence 2014 by TripAdvisor, the world's largest travel site. The award is given to outstanding hospitality businesses that have received praise and recognition in reviews by travelers. Indochina Odyssey Tours is dedicated to providing high-quality private Indochina tour for worldwide travelers. Putting customers' needs and preference first, we tailor-make personalized tours to the most popular destinations in Vietnam, Cambodia, Laos, Myanmar, and Thailand. For our consistent quality service, we wined the TripAdvisor's Certificate of Excellence in 2012 and 2013, and are honored to be the winner this year. All awards we have received, including the Outstanding Contribution Award issued by the Vietnam National Administration of Tourism, encourage us to continue our thoughtful and professional service and pursue greater satisfaction of our customers. With the same service consciousness, our sister brand China Odyssey Tours is also awarded the Certificate of Excellence 2014 by TripAdvisor.